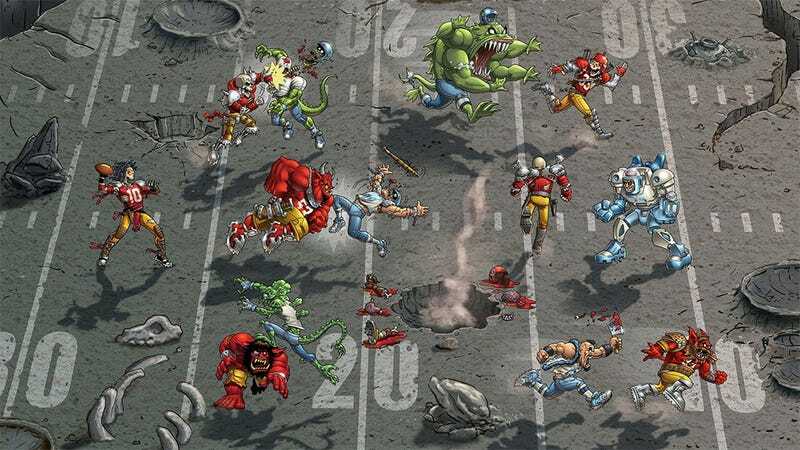 For a game that spawned a cartoon spin-off, a comic book and an action figure line, there's been no activity at all on the Mutant League Football front since the game was released on the Sega Genesis back in 1993. Do you want to bring it back? That's what game creator Michael Mendheim would like to know. Mutant League Football was huge in 1993. Despite being launched on only one platform, Electronics Arts' combination of gridiron madness and actual madness was incredibly satisfying, much more so than Human League Football, which nobody wanted, baby. If Mutant League Football were released today, EA would already have three sequels in development and a free-to-play mobile version, but 1993 EA seemed content to let the game die. It's still dead, mind you. The new Kickstarter project being worked on by Mendheim, the folks at Robomodo and several interesting talents from comics, video games and art is actually called Mutant Football League, which is totally different, or at least different enough for lawyers. Mendheim and co. want this game to be huge, with some 30 teams of fully-customizable players battling it out in single games or full seasons, where keeping your squad in one, moving piece is as important crossing the goal line. I can dig it. It's an ambitious project, with an ambitious goal — Mendheim is asking for $750K to get the game done by next year. Are there enough fans of the original to make it happen? Hit up the link below and keep track of the carnage.